I'd love to get a nice, clean, as stock as possible '92-'93 notchback Mustang LX. in about 2-3 years, id like to get a CTS-V for a DD. well that and my jeep would share DD duty.. have the best of both worlds.. i figure in 2-3 years, i should be able to get a decent 07-08 CTS v for well under $20k. Well, 07 yes, but not the one you have pictured. There wasn't an 08 CTS-V and the one you have pictured is the current generation 09 and newer. You won't see an 09 for under 20k anytime soon, hell even under $30k in two years may not happen. I think we are now best friends. E39 M5, are the biggest maintenance ***** ///M BMW's ever made. Trust me, I've owned one. They were amazing vehicles when they were new, however as the years past, it's just not worth putting the $$$ in repairs all the time towards one anymore. I like the First gen CTS-V over the new ones, the new ones look chunky. Well I would answer this thread with a Porsche 911 GT3, or even just a 911 turbo. But a Cayman falls more into affordability. haha. on a semi related note, i just scanned in these images of a stunt car from hardcastle and mccormcik that i took pics of in 1991 in FL. by semi related, the "hero" car for that series in the 2nd/3rd season was actually a delorean with its body panels replaced with ones to resemble the earlier smaller coyote. 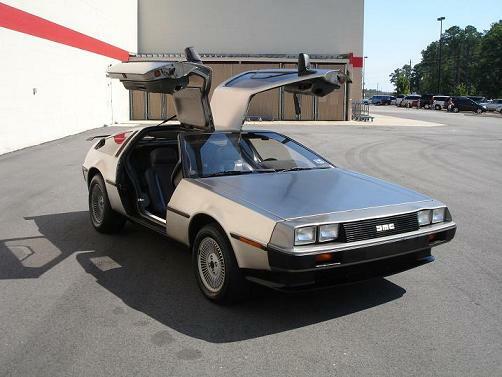 and the hero car showing the doors open and delorean interior. Last edited by HuJass; 08-16-2011 at 07:38 PM. If I absolutely needed another car, I'd take out a small loan and buy something like a used Yaris for $8000ish. Last edited by Erik; 08-16-2011 at 07:46 PM. 03 or 04 Mustang GT 5 speed for a fun yet somewhat economical (in terms of upkeep/repairs) daily driver. Or a 03 or 04 Mach 1 for more of a toy. Always loved those and wanted one. 08-10 Cobalt SS. I know a few members here have one. 30+ mpg on the highway but still just a tune & intake away from 300whp. Very impressive cars, just still not too hot on the looks, sound, and FWD. Say what you will about C4 Vette's, but they will always have their place with me as they remind of my childhood and good memories with my dad. Must say you have good taste in cars INDAZ... that is my car!! I assume you saw it on Corvette Forum where I have it listed for sale. It's kind of a weird situation when you are scrolling through random posts and see your own car and you didn't post it. It truly is an awesome car, I really wish I didn't have to sell it.